Life isn’t easy. There are bigger issues like dealing with divorce and the passing of loved ones, but more often than not, the little things are what tip us over the edge. Sometimes, you just need somewhere to vent and you’ll feel better. Aiming to provide you with such a venue is Common Struggles. This site provides “anonymous stories of everyday struggles,” offering a reminder that you certainly are not alone in dealing with day-to-day difficulties. One of the biggest challenges faced by owners of content-based websites is coming up with that content. And then you have to elaborate on those ideas to create the content itself. Common Struggles takes an entirely different approach, in this regard. 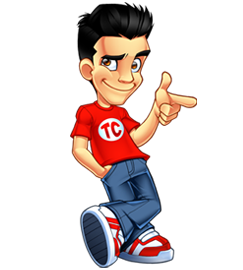 Instead of being a website populated only by content written by the site owner, it’s a collection of content submitted by the online community. This “crowd sourcing” lends itself to a limitless number of voices, viewpoints, and stories. In this way, you’ll be reading the short snippets provided by the average web surfer when you make your way through the Common Struggles archives. 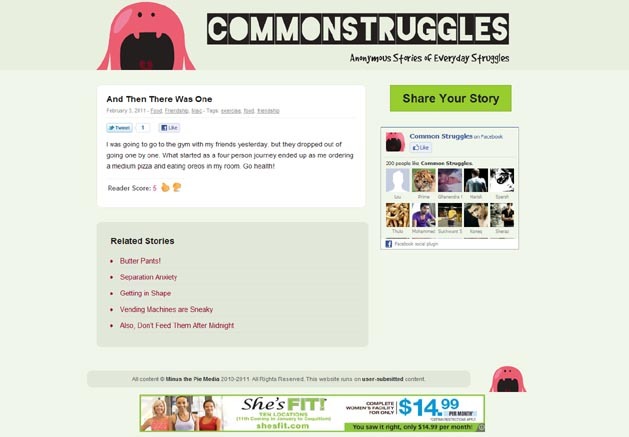 Common Struggles is not unique in taking the “crowdsourcing” approach to site content. You might be familiar with other sites like ICanHasCheezburger and DamnYouAutoCorrect. In effect, the site owners are able to capitalize on the “free labor” of the masses. Sure, there could be some editing and formatting involved, but turning to the public for content is easily one of the most cost-effective ways to get original stories posted on your site. In this way, Common Struggles could have a lot of potential. A big part of this is that the submission form reminds visitors that all submissions are completely anonymous. This helps to remove some inhibitions, as they can freely rant about anything without the fear of “getting caught” by whoever they may be ranting about. Curiously, comments have been disabled on all the posts on Common Struggles. 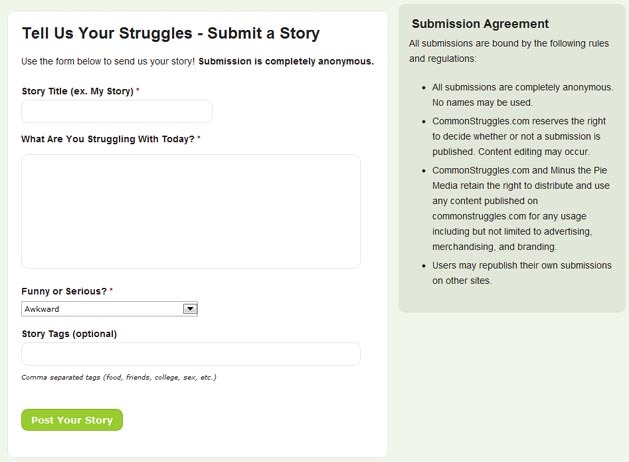 According to the site owner, this was meant to encourage people to submit their struggle stories through the official form instead of just commenting on the stories of others. I’m not sure if I completely agree with this strategy. Oftentimes, the comments on posts can be quite different from the stories being submitted. Comments can help to build up a community and give the sense that the site is a busy place that people want to visit again and again. Seeing how this is a “make money online” blog, it only makes sense for us to dive a little further into how Common Struggles makes money online. Here is a snapshot from one of the struggles. As you can see, there is a Google AdSense banner across the bottom of the page. When you are in a main index page, there is also a Google AdSense block in the sidebar. For now, those two placements are the only visible monetization for Common Struggles. Moving forward, I wouldn’t be at all surprised if we were to see some more aggressive advertising in the form of in-text ads, sidebar text link ads, pop-ups, and more banners. It’s a delicate line, to be sure, as you don’t want the advertising to discourage visitors from coming back. As a concept, Common Struggles holds some promise. Going with user-submitted content means that, given a decent level of traffic, you’ll always have a supply of content ready to go. The struggle, then, is determining what content is worth posting. Based on the submissions that have been posted thus far, I find that Common Struggles hasn’t quite reached that level of quality yet. Many of stories are neither funny nor interesting. It also doesn’t help that there is no real “about” or “FAQ” page, so a lot of people won’t “get” what they should be submitting in the first place. Having a page with some general guidelines will go a long way, but the eventual success of Common Struggles really depends on whether it can solicit a large number of quality stories. Without the viral nature of something like lolcats, Common Struggles will have quite the struggle ahead of itself. It’s my first time to hear about that website but I love the idea behind it. But there is not much traffic so far in that site. It’s not a bad idea for a site, but I don’t think it should be formatted as a blog. It would be much better as a full website with ratings and better sorting. That way people can get straight to the best rants. Getting traffic may be a struggle regardless. It’s the kind of site that you need content to get traffic and you need traffic to get content. It’s the kind of catch-22 that might need advertising investment to really get going. I think any newbie that wants to make money blogging or online will have frustrations. To make money online, you need to be patient and work hard. Blogging isn’t hard at all, you just need a bit of experience and testing. You need to know what’s an RSS feed, monetization, traffic, content etc… and you will start seeing success. Man, way too many spammy paid posts here these days. Are you hurting for cash or something? Just going through the site, looks like a real fun way to pass time. Nothing like reading others experiences. The FML site was a lot of fun and even though this is similar, with some improvements, it could be more popular. I like Aluminum’s suggestion of making it a site instead of a blog, for one. This is funny. I’m going to check this out. a very good website especially for those who lack people to share their feelings with.. I wonder how well they will fare with the new Google algoritm update targeting thin content. Doesn’t look like there’s much content on most of their pages. Ohh man, don’t mention in text ads. Whenever I visit a site where the text is splattered with double underlined words, I’m out of there in a heart beat. Can’t. Stand. In. Text. Ads. I seem to remember there being another similar website, with a bit of a more negative bent to it. Users submitted their rants/stories and people rated them etc. I think the user generated content model is a solid business model to follow, but monetization might prove tricky. They also might have a heck of a time building up solid traffic, unless they get a boost from Facebook or YouTube. Hello Michael, It’s my first time to hear about that website but I love the idea behind it. I enjoyed your articles. This is truly a great read for me. I have bookmarked it and I am looking forward to reading new articles. Keep up the good work! I’M JUST SO FED UP WITH EVERYTHING GOING ON IN MY LIFE RIGHT NOW. I DON’T HAVE A JOB, BUT I’M IN SCHOOL. I DON’T HAVE A CAR, BEHIND ON BILLS, CAN’T GET ANY HELP FROM ANY OF MY FAMILY MEMBERS, CHILDREN ARE STRUGGLING, I JUST WANT TO SCREAM MY TROUBLES AWAY! I WISH THERE WERE SUCH THINGS AS MONEY TREES! IF THERE ARE ANY RICH PEOPLE OUT THERE THAT’S WILLING TO GIVE, NOT LOAN, ME SOME MONEY SO I WON’T BE SO STRESSED OUT, I WILL GREATLY APPRECIATE IT.